Join us for our next Cooking Class with Tulsa Tech in Owasso on April 23rd. Get ready for Cinco de Mayo, from fun bean appetizers to key lime desserts! Bring a friend to cook up some fiesta flavored proteins and prepare a salsa full of nutrients to top off your meal. Designed for post-operative Bariatric patients. To register or for more information, please click here. We always encourage a patients to "pair" their carbohydrate foods with a protein food. Not only is this delicious and filling, a serving of this breakfast casserole is a nice balance of protein and carbohydrates as well as Vitamins A and C. These function as antioxidants and boost immunity in the body. Learn more about our free seminars. Because of limited stomach volume, it is often challenging for bariatric patients to consume adequate amounts of vegetables. This sweet potato turkey chili provides a healthy dose of not only protein but also of a variety of vitamins, minerals, fiber and antioxidants. Just one cup is loaded with nutrients beneficial for improved health: ground turkey as a lean protein source; black beans, which are high in folate, Vitamin B6, fiber and phytonutrients; sweet potatoes, which are rich in Vitamin A; tomatoes, which are high in lycopene, an anti-oxidant. Enjoy! Chicken doesn't have to be boring. Dress up the star of your meal with carmelized sweet potatoes, apples and Brussels sprouts and a sprinkle of rosemary. Did someone say pumpkin? This bariatric-friendly dessert has just the right touch of sweetness, and it includes a punch of protein! Getting enough Vitamin A and protein can be challenging after surgery. Post-op patients can sometimes be deficient in Vitamin A because of a decreased intake of fruits and vegetables. The source of protein in the custard is a whey protein, which is the most absorbable form of protein. What do you get when you swap tortilla chips with a bell pepper for nachos? You get a tasty treat that packs a nutrition punch. Bell peppers bring a nice amount of vitamins A, C, B6 and K. You'll also get some fiber and crunch. And... did we mention fewer carbs? Enjoy! Beat the summer heat with this fresh and healthy Greek yogurt bark! Step into spring with this pink protein drink! This spicy shrimp sushi stack is a delicious mouthful. It tastes great with crab, too! Here’s a delicious twist for fried rice: substitute cauliflower for rice! "Plentiful" is often the theme of fall whether you’re at a tailgate or Thanksgiving gathering. We’re here to help with a healthy and delicious white bean dip recipe. We hope you “fall” for this dip too! Eating fish twice a week like this oven-baked tilapia is beneficial for your body. Fish is rich in Omega-3 fatty acid and is easier for bariatric surgery patients to digest. 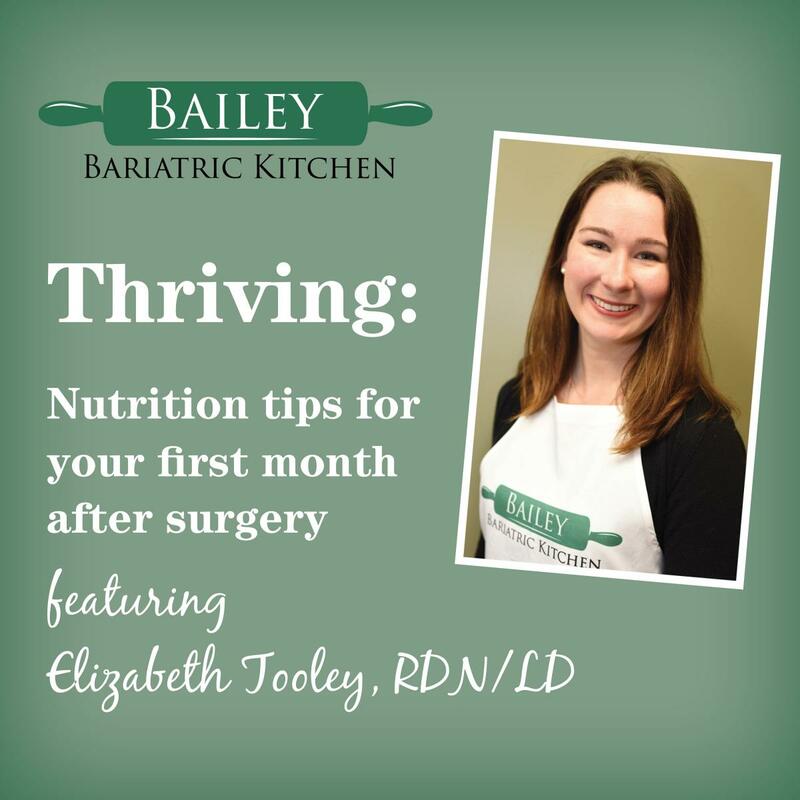 Watch Bailey Bariatric Kitchen: Nutrition tips for your first month after surgery. 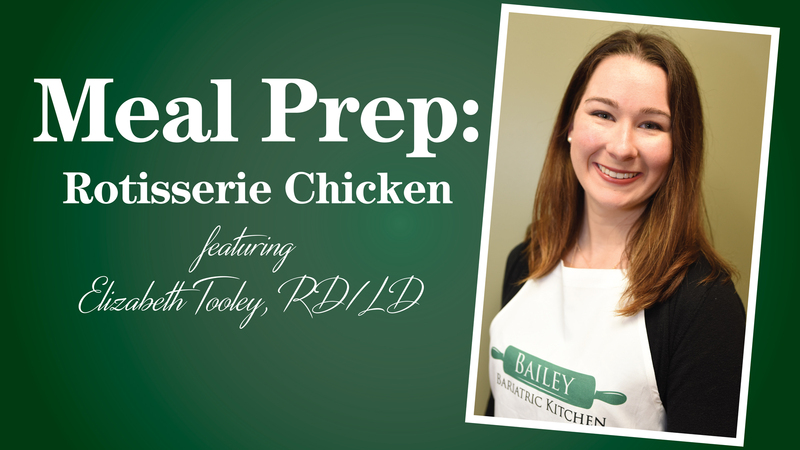 Watch Bailey Bariatric Kitchen: Meal Prep.